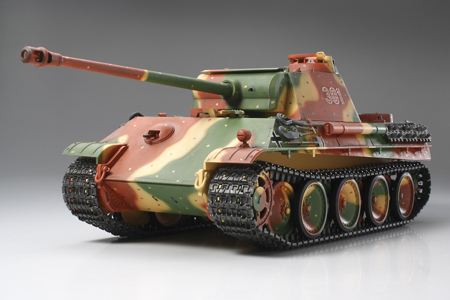 Tamiya German Panther Type G - Full Option RC Tank Model Kit. These 1/16 scale models can be equipped with IR battle systems. Then you can set up mock battles with 2 or more tanks and have your own tank battles in the comfort of your backyard. Special Order Item. 1/16 scale radio control tank features 4-channel operation with DMD control unit. Ready to assemble R/C model kit of the German Panther Type G, which is widely considered to be a masterpiece of WWII weaponry. Large scale model features accurate details and incredibly realistic depiction of Panther. Features forward/reverse running, right/left turning, turret rotation, gun elevation and gun barrel/ hull recoil action. Actions such as running and main gun firing are linked with sounds. Muzzle flash of main gun & machine gun are also linked with sounds. Includes shaped aluminum 75mm gun barrel. Metal chassis, suspension arm and torsion bar heighten durability. Battle system (available separately) enables exciting tank-to-tank combat. 2 Tamiya compatible 7.2V batteries and charger. Install ITEM TAM53447 Tank LED Battle System (sold separately) for 1-on-1 or team battles against other similarly equipped Tamiya R/C tanks.